Life in New Zealand Integrating Skills. What has been mentioned in Reading ? Please kick them out. 1.geography 2.history 3.language 4.sports and spare. 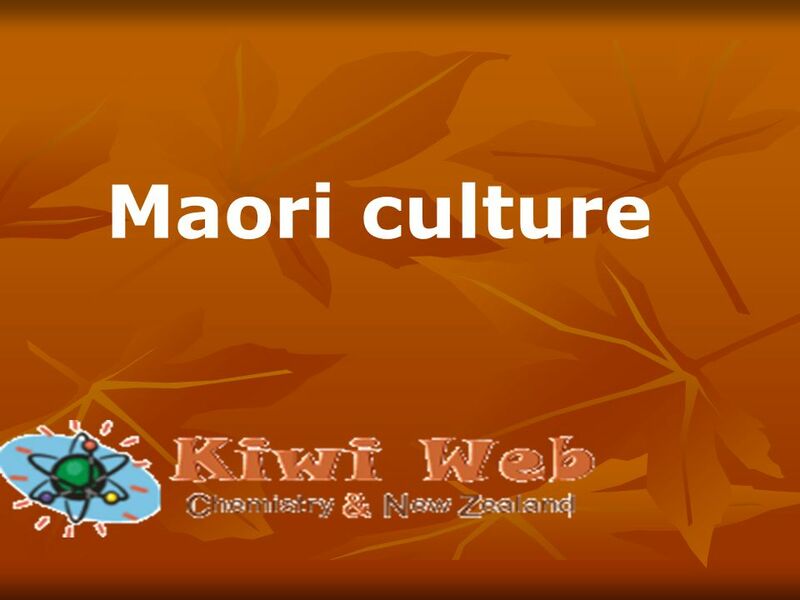 3 What further knowledge about New Zealand would you like to get? 4 : There is a place on our earth where hot water and steam come from under the ground. It is a large island in the Pacific Ocean. The island is North Island, in New Zealand. The planet on which we live is a ball of very hot rock. It is a good thing for us that the outside shell is cold. The earths shell has cracks( ) in it some places. In New Zealand this shell seems to have more cracks than in other places on the earth. In some places, hot water shoots (goes up ) into the air from time to time. At other points, you can see steam coming from pools of hot water. 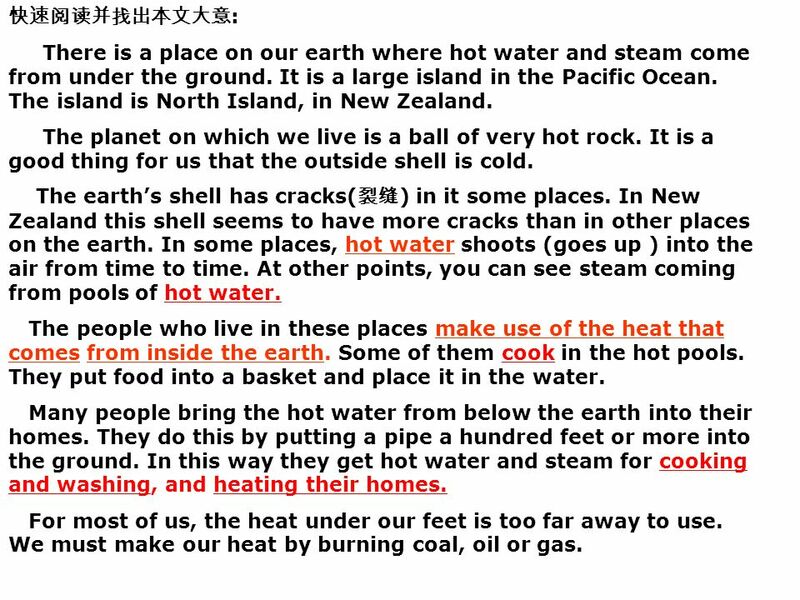 The people who live in these places make use of the heat that comes from inside the earth. Some of them cook in the hot pools. They put food into a basket and place it in the water. Many people bring the hot water from below the earth into their homes. They do this by putting a pipe a hundred feet or more into the ground. In this way they get hot water and steam for cooking and washing, and heating their homes. For most of us, the heat under our feet is too far away to use. We must make our heat by burning coal, oil or gas. 5 : There is a place on our earth where hot water and steam come from under the ground. It is a large island in the Pacific Ocean. The island is North Island, in New Zealand. The planet on which we live is a ball of very hot rock. It is a good thing for us that the outside shell is cold. The earth s shell has cracks( ) in it some places. In New Zealand this shell seems to have more cracks than in other places on the earth. In some places, hot water shoots (goes up ) into the air from time to time. At other points, you can see steam coming from pools of hot water. 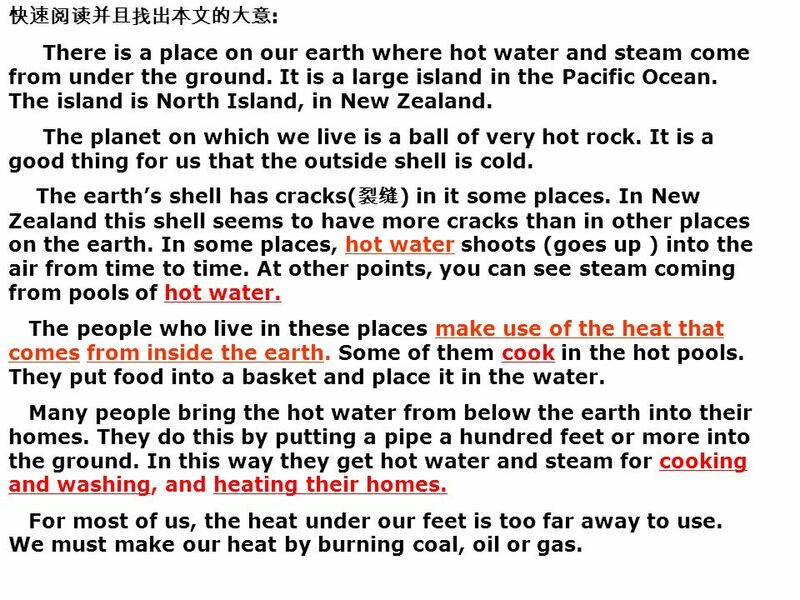 The people who live in these places make use of the heat that comes from inside the earth. Some of them cook in the hot pools. They put food into a basket and place it in the water. 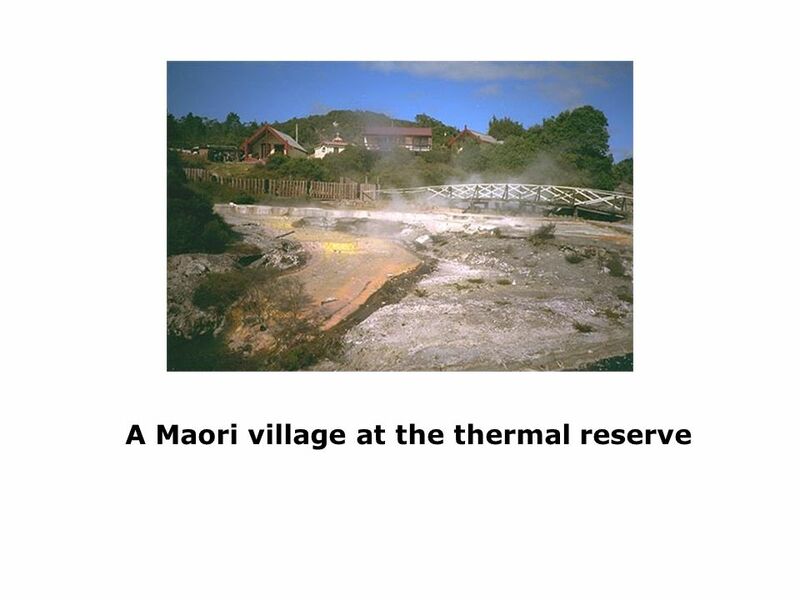 Many people bring the hot water from below the earth into their homes. They do this by putting a pipe a hundred feet or more into the ground. In this way they get hot water and steam for cooking and washing, and heating their homes. For most of us, the heat under our feet is too far away to use. We must make our heat by burning coal, oil or gas. 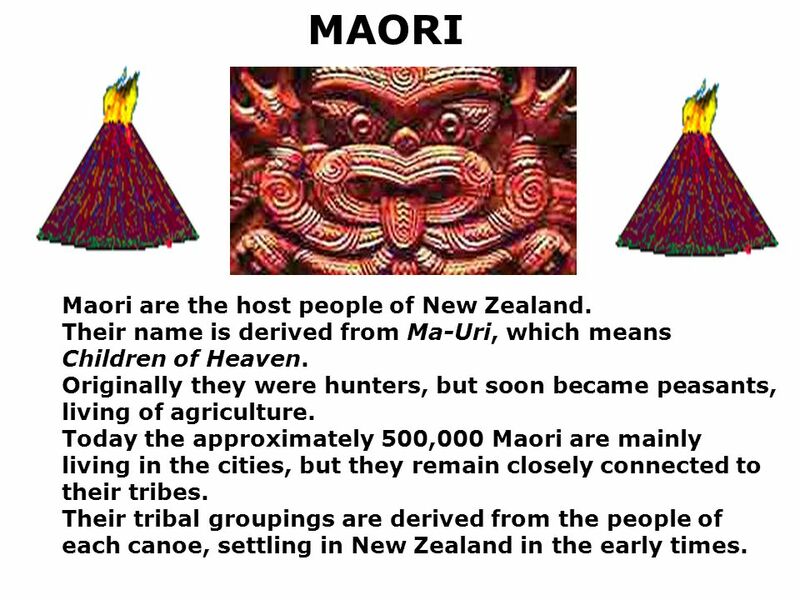 8 MAORI Maori are the host people of New Zealand. Their name is derived from Ma-Uri, which means Children of Heaven. Originally they were hunters, but soon became peasants, living of agriculture. 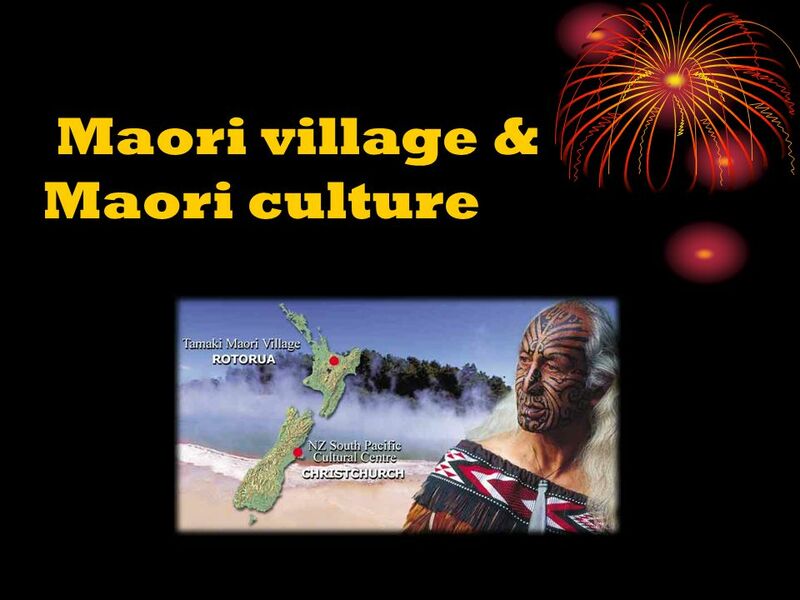 Today the approximately 500,000 Maori are mainly living in the cities, but they remain closely connected to their tribes. 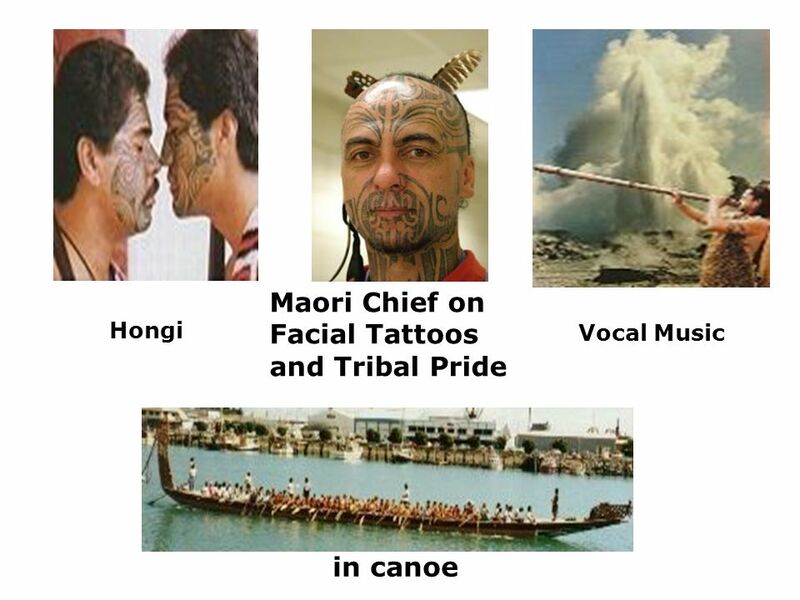 Their tribal groupings are derived from the people of each canoe, settling in New Zealand in the early times. 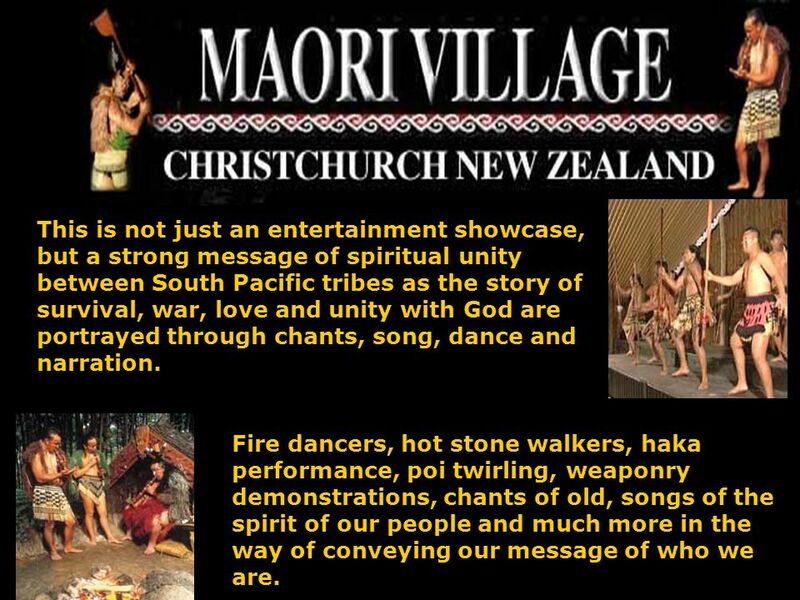 10 This is not just an entertainment showcase, but a strong message of spiritual unity between South Pacific tribes as the story of survival, war, love and unity with God are portrayed through chants, song, dance and narration. Fire dancers, hot stone walkers, haka performance, poi twirling, weaponry demonstrations, chants of old, songs of the spirit of our people and much more in the way of conveying our message of who we are. 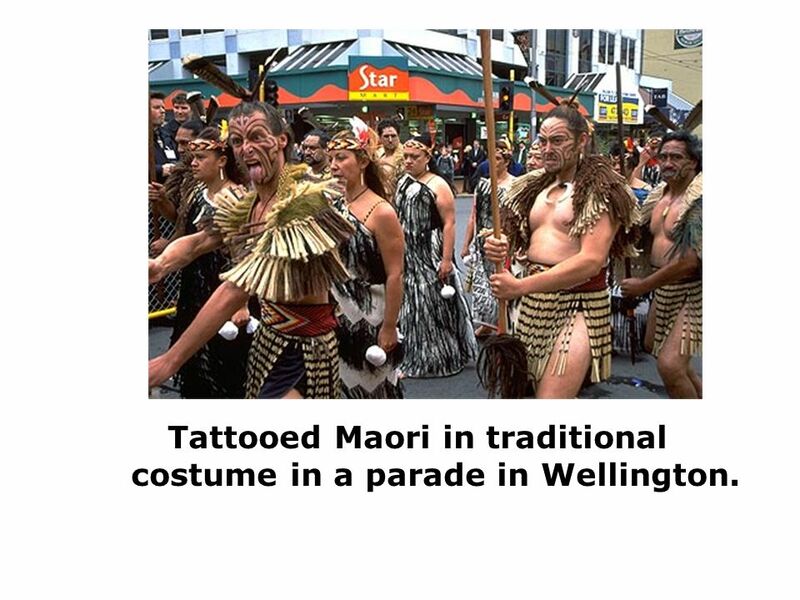 13 Tattooed Maori in traditional costume in a parade in Wellington. 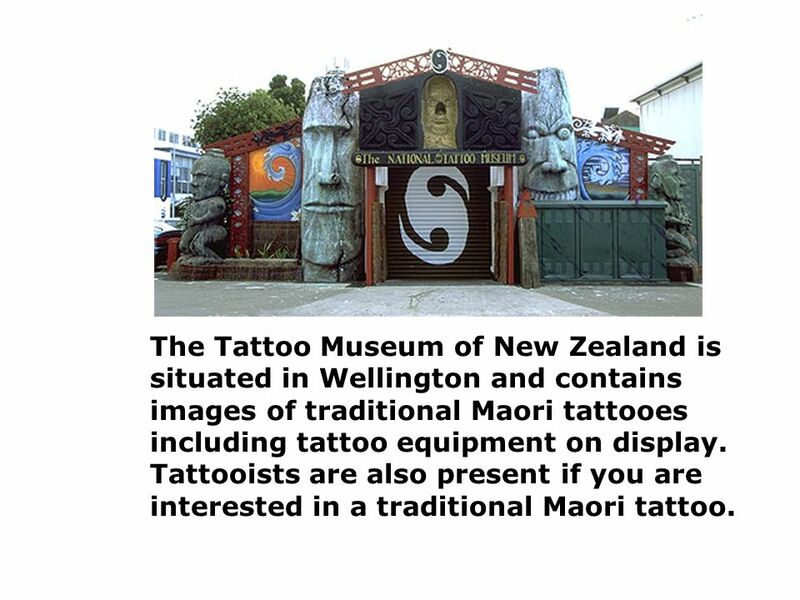 15 The Tattoo Museum of New Zealand is situated in Wellington and contains images of traditional Maori tattooes including tattoo equipment on display. Tattooists are also present if you are interested in a traditional Maori tattoo. 16 Useful words and expressions: 1.has a population of 2.of which 3.the majority of 4.sign 5. take place 6.at an early age 7.turn to sth./doing sth. 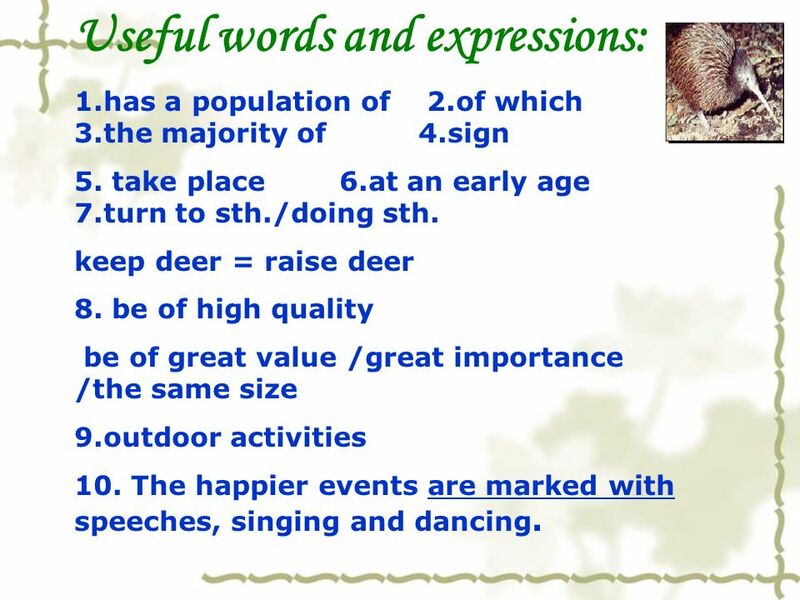 keep deer = raise deer 8. be of high quality be of great value /great importance /the same size 9.outdoor activities 10. The happier events are marked with speeches, singing and dancing. 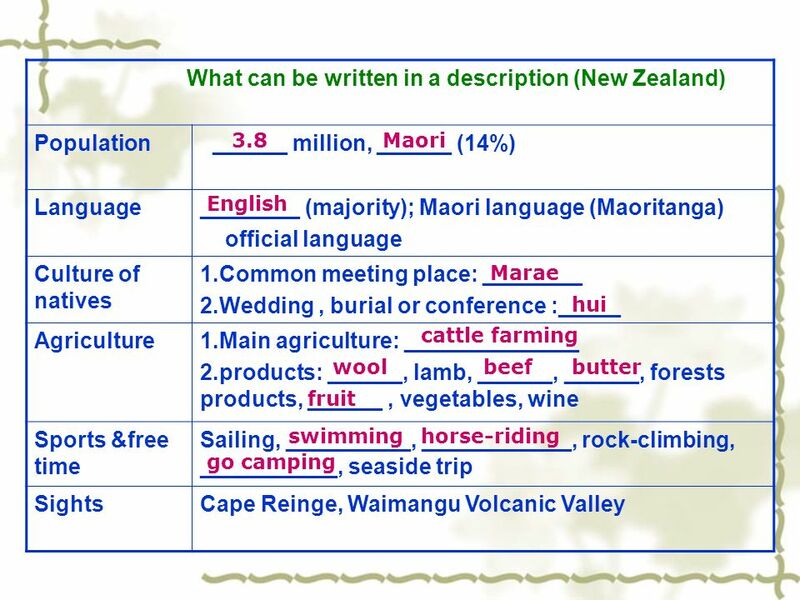 18 Tips: How to describe a country or a region First paragraphWrite about the population, ethnic groups and the languages spoken by them. 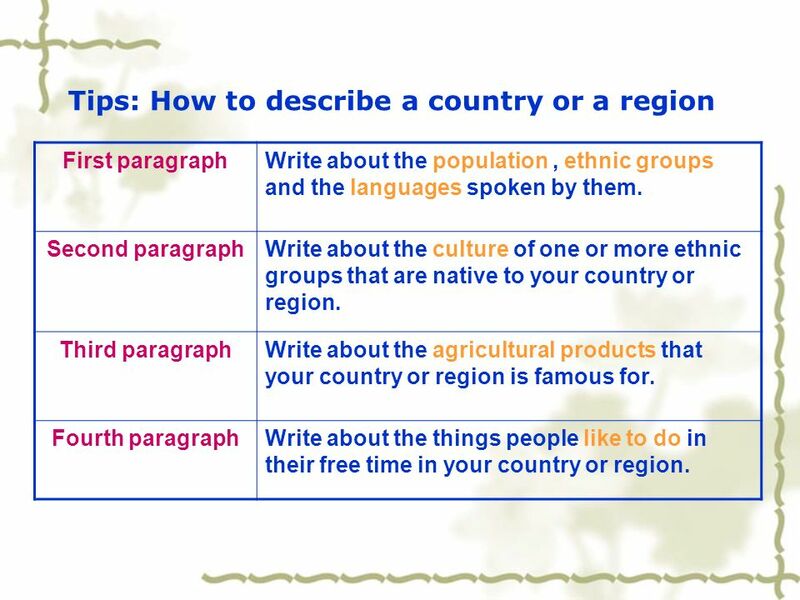 Second paragraphWrite about the culture of one or more ethnic groups that are native to your country or region. 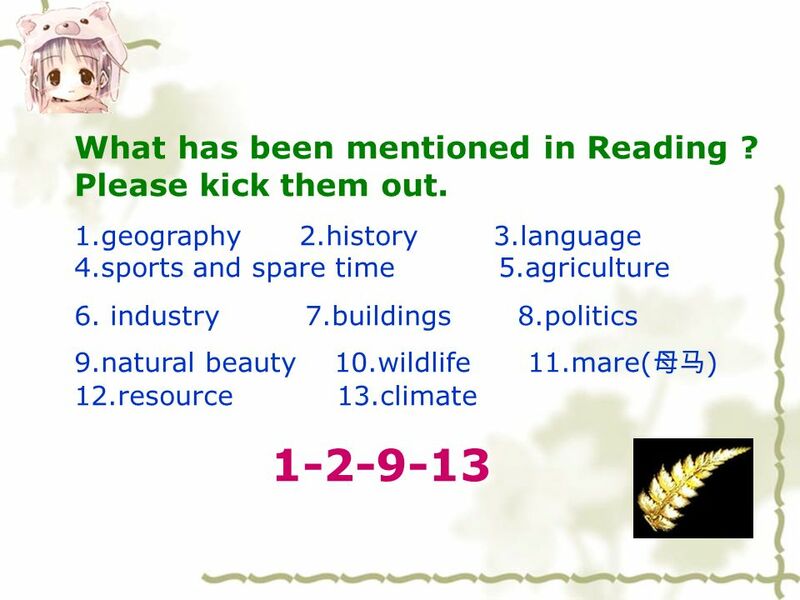 Third paragraphWrite about the agricultural products that your country or region is famous for. Fourth paragraphWrite about the things people like to do in their free time in your country or region. 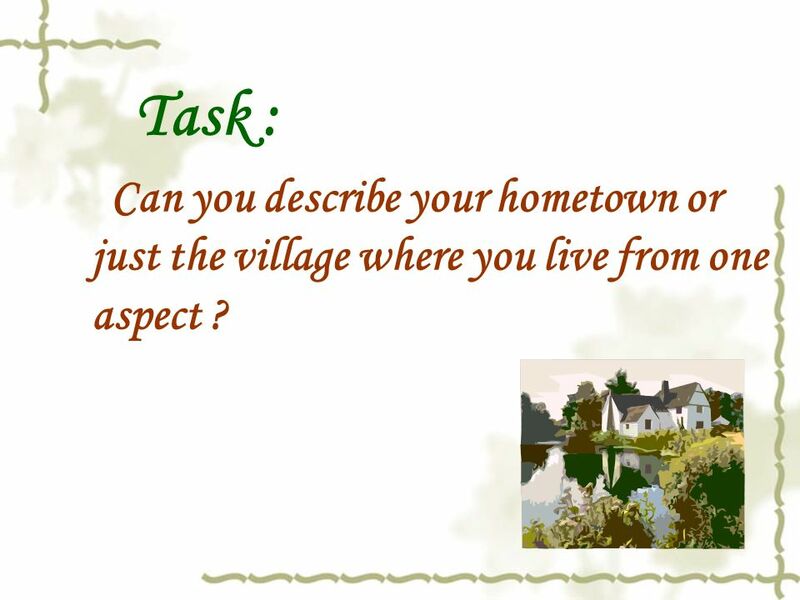 20 Task : Can you describe your hometown or just the village where you live from one aspect ? 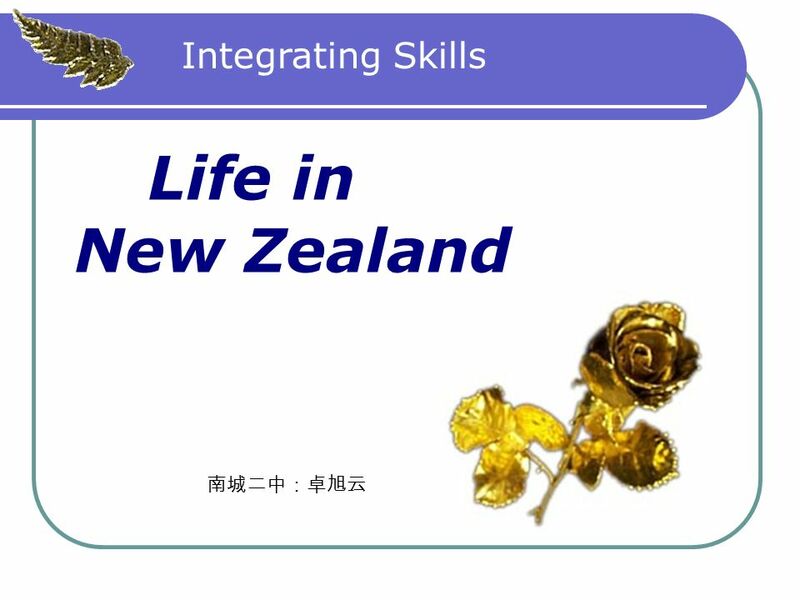 Download ppt "Life in New Zealand Integrating Skills. What has been mentioned in Reading ? Please kick them out. 1.geography 2.history 3.language 4.sports and spare." 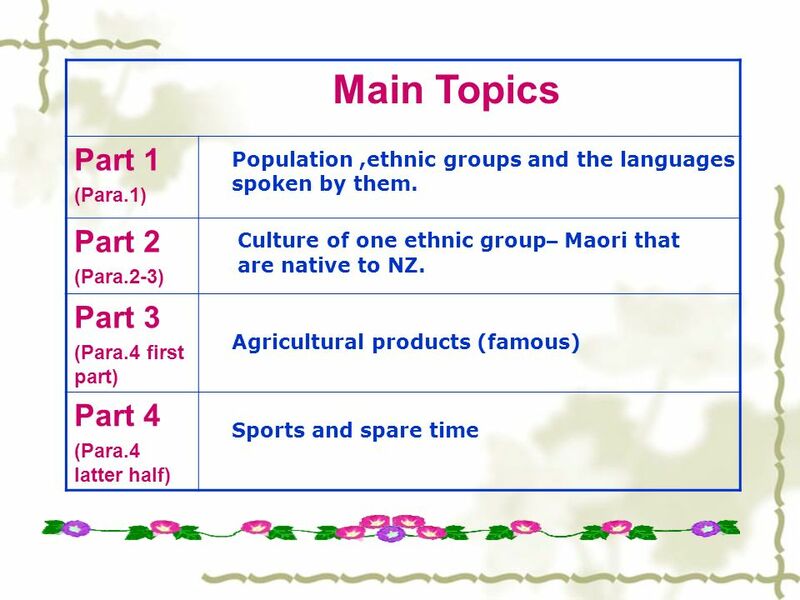 Lesson 73 Unit 19 The Maori of New Zealand. Presentation Where is New Zealand? How many islands is New Zealand made up of? What is the capital? Who is. International Day Practice! Gathering Data Through All Senses! Creating Imaging And Innovating! All grades in the school chose a country to represent. Rodney College New Zealand Coast to Coast. Our college in the heart of Wellsford. Country Project by Nicole NIGERIA This is Nigeria's national image. Freeport, Illinois Guatemala is a country in Central America, with a population of approximately 13 million people. It is about the size of Tennessee and. THE DAWN OF HISTORY Who studies history? 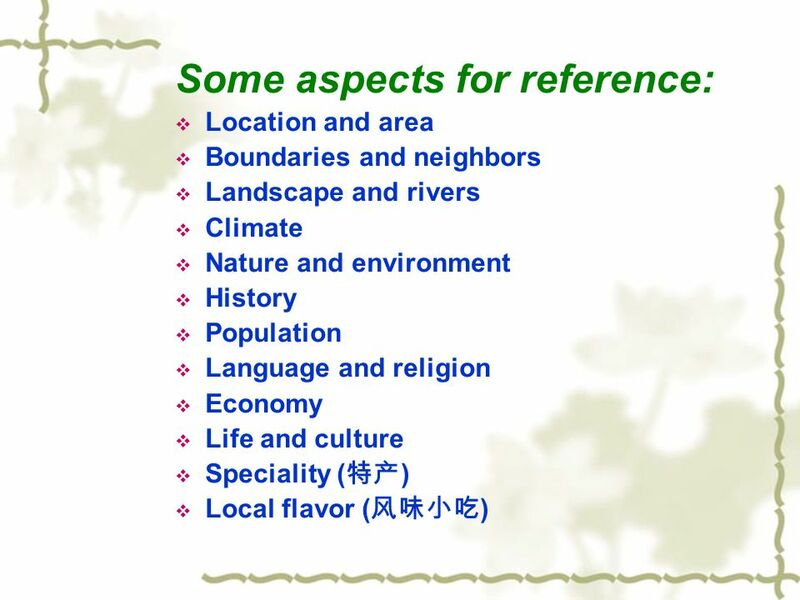  Geography: Study of people and environment  Anthropology: study origin and development of people/societies. Native Americans Native Americans were the people who lived in America before people from other countries came here. Vocabulary for Mexico Latin America – all land south of the US Middle America – Mexico, Central America, and Caribbean Islands Sierra Madre Mountain. English-speaking countries Rusak Liza Form 7a. New Zealand It is situated in the Pasific Ocean to the south-east of Australia,on two big islands and a. What do you know about Australian Aborigines? Chapter 2, Lesson 2 ACOS #3: Compare major Native American cultures in respect to geographic region, natural resources, government, economy, and religion.